Donny and Marie is a family-friendly show that follows the winning formula of their 1970s TV program, incorporating dancing, humor and plenty of their hit songs and current chart-toppers. 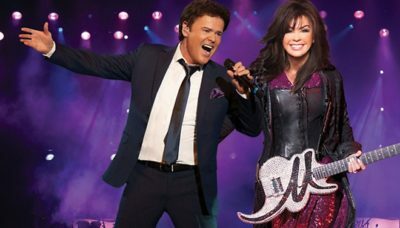 Whether you’re a little bit country or a little bit rock and roll, Donny and Marie Osmond will have you dancing in your seats (or maybe the aisles depending on whatever you’re sippin’ on) with their feel-good Vegas concert. Still performing together today with every bit of gusto and showmanship that previously sky-rocketed the two into teen stardom, Donnie and Marie’s headlining Las Vegas show takes audiences back to yesteryear while simultaneously indulging onlookers with today’s popular hits. The intimate showroom at the Flamingo is a perfect fit for Donny and Marie, offering a good view from just about any seat and allowing the performers to walk out into the audience and get close to their fans. The classic Vegas-style room features booths and tables and contributes to the feeling of nostalgia the duo evokes with their show. Donny and Marie have been crowd pleasers in Vegas since childhood and judging by the fact that they’re still consistently selling out shows, they’ll continue to be welcome for many years to come.